There is a 15 second iPhone video clip on Twitter at the moment of a big lad, full of muscles, destroying a door inside a building. It takes him two punches, one kick and both his hands to wrench the door right off its hinges. Accompanying this is some very stark copy which talks about how he’d had a job booked in to install a boiler, but he had lost out on price to one of the big, direct-to-consumer online brand names. His fury carries over from the film to the text with some very explicit language. The change in the domestic heating and hot water marketplace is that online buying is now taking over the supply chain. The boiler manufacturers, some of them, want to sell more and more direct to the consumer. It is as simple as that. The traditional route to market of: manufacturer -merchant/distributor – installer-end user/consumer is getting to be less and less and may well soon be gone. The new route to market may well have some casualties – the merchants/ distributors and installers. It may well hit installers hardest in terms of prices being driven down. Boiler producers have traditionally made their margin at the factory gate. – The merchant/distributor may never of made the size of margins, on boilers, anywhere near as much as the manufacturers. 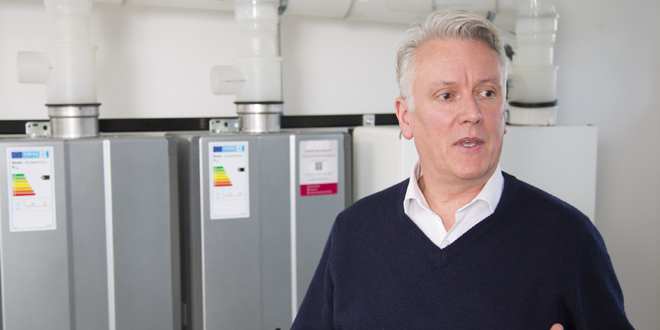 Traditionally the merchants/distributors relied on the branded boilers to bring the installer into their sales arena and buy all the materials for an installation and make up the margins on fittings, piping and ancillaries. The BBC News website and the Retail Gazette recently extensive articles and reports on the dramatic demise of shopping centres and malls. Dead or dying High Streets, zombie retailing – the clichés were wonderfully employed. Retail Gazette quoted some very heavyweight financiers – APAM Asset Management. They reckoned that there were as many as 200 – yes, two hundred – shopping centres that were financially on the edge of business existence. Asset management firm APAM estimates that hundreds of shopping centres worth around £7 billion are in danger of breaching debt covenants. This number has reportedly increased by 75 per cent since last year, as falling market values and increasing numbers of CVAs butcher the sector. Retail Gazette reported that APAM’s executive director Simon Cooke said this was in part due to lack of reinvestment by private equity owners, with the average shopping centre in the UK having changed hands or been refinanced three-and-a-half years ago. The BBC News report quoted Retail Gazette and also added in its own experts. Mr Nelson Blackley, from the National Retail Research Knowledge Exchange Centre, said the growth of online retail in the UK – on sites such as Amazon – had been faster than in almost any other retail market in the world. The demise of “major anchor stores” like BHS and Toys R Us and the rise of online shopping has caused a “downward spiral”, said Mr Nelson Blackley. “If the major anchor store moves out, that has a halo effect on other stores in that centre. It’s a downward spiral and you can’t fill shopping centres with nail bars and vape shops.” Mr Blackley, who is based at Nottingham Trent University’s Nottingham Business School, pointed to research in the Financial Times that suggested about £2.5bn worth of shopping centres and retail parks are up for sale in towns and cities across the UK. Some of this marketing is unofficial and not in the public domain,” he said. “It’s a trend that’s moving very quickly. You don’t necessarily want to be in the business of owning shopping centres at the moment.” No kidding Mr Blackley……. We made our own decisions several years ago. Then, about 30% of our total sales were through the distribution route to market. That is now around 15% and that is with distributors which are geographically and strategically placed to deliver – direct to the installer. It is not difficult to envisage that with just a few years that the big brand names will be aiming everything they’ve got direct to the end-user/consumer. But it may well be at the expense of the installer, who may well have to work on an iron-clad fixed price basis which may not be the true value of the job. But it is the installer that is our future and we see nothing on the horizon likely to change that – after all, all gas fired products must, by law, be installed by a fully qualified Gas Safe person. And that means that the individual must have a high level of expertise and ‘Yes’, we deal with specification and consultants, but that is inevitable on commercial sites which require design and engineering services. engineering savvy…. which is what installers have…. And one final thought – maybe there are even more changes on their way, this time in the manufacturing arena?